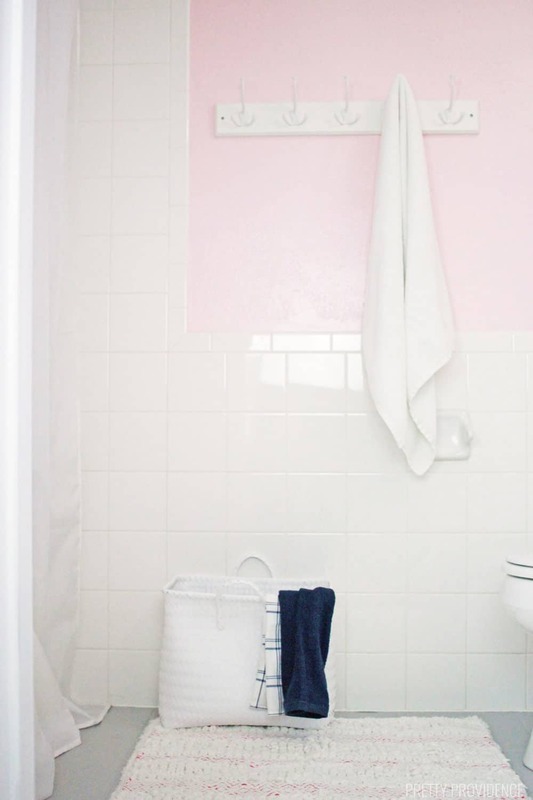 I am really excited to share my little girl’s blush pink bathroom makeover with you today! I wanted to make this small bathroom feel bigger, using mainly paint and new decor and I love how it turned out! This post is sponsored by BEHR®. All opinions and enthusiasm for their product is my own. It’s been almost five years since I moved into my 1980’s home, and the bathroom that we spend the most time in was also the ugliest! It was high time that I finally finish giving it a makeover. This is our little girls’ bathroom, which also doubles as the guest bathroom when we have family stay with us. We had been making small improvements to it here and there. 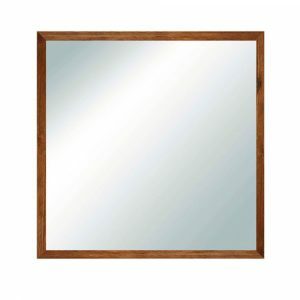 My husband replaced the vanity, the light fixture, and the mirror last summer. We also repainted the bathroom with BEHR® Marquee paint, but it still didn’t have the personality that it deserved! Can you believe that the picture on the left is the same room as the picture on the right? Honestly, I had forgotten how bad this bathroom was! This ‘before’ photo is from the day we got our keys. The 1980’s tan marble seashell sinks were in every bathroom. I really can’t tell you how happy I was to see them go. 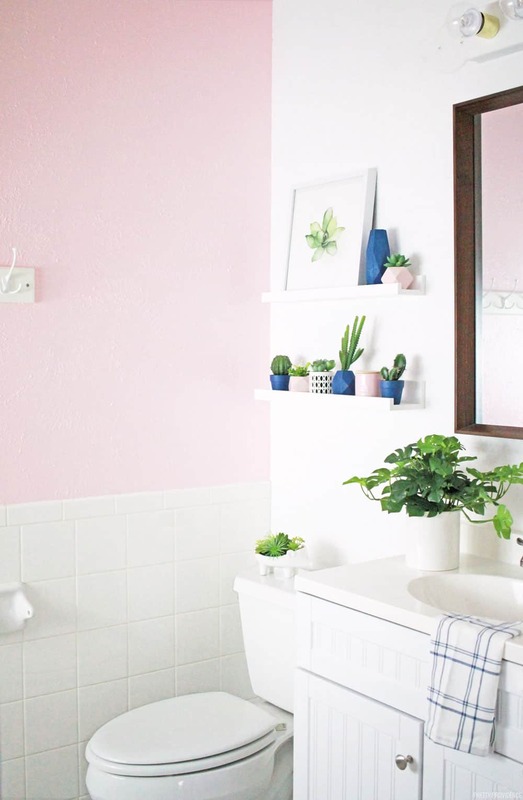 Choosing a paint color for a bathroom can be tricky, especially if it’s a small bathroom with little to no natural light, like this one. I always try to choose a light colors and so for this one, I knew I wanted to go blush pink. I found the perfect shade in the new BEHR Premium called Youth Blush. 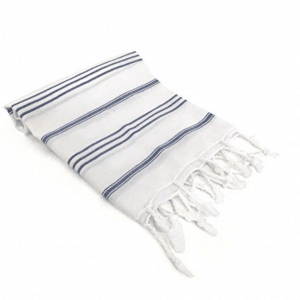 It’s soft and classic and a little bit vintage, and I love it SO MUCH. The rest of my walls in this room are my favorite warm white called Polar Bear. We have been using Polar Bear in every room in our house since we found it a few years ago. Have you ever used the color tools on the BEHR website when you’re picking paint colors? I highly recommend it. They have a tool called ColorSmart where you can browse colors, and then with one click you can see what it actually looks like on a wall. To take it a step further, they have Paint Your Place® where you can upload a photo of your room and preview how the paint would look in your home! 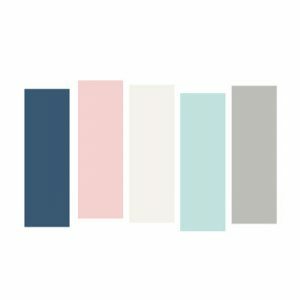 If you happen to love this color scheme, you can order paint samples from my color palette right here. Small bathrooms can be very difficult to decorate. There isn’t really room to put cute accessories, especially if you are short on counter-space. 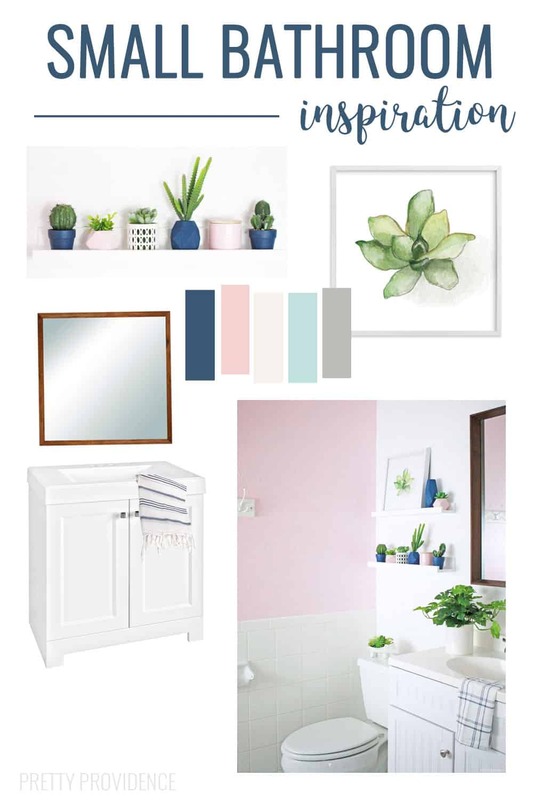 I decided that two small shelves, which are actually picture ledges, would be the best way to be able to decorate the bathroom. We painted them white and hung them above the toilet. 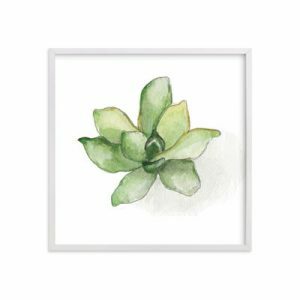 They hold little cacti and succulents in pots and an art print. 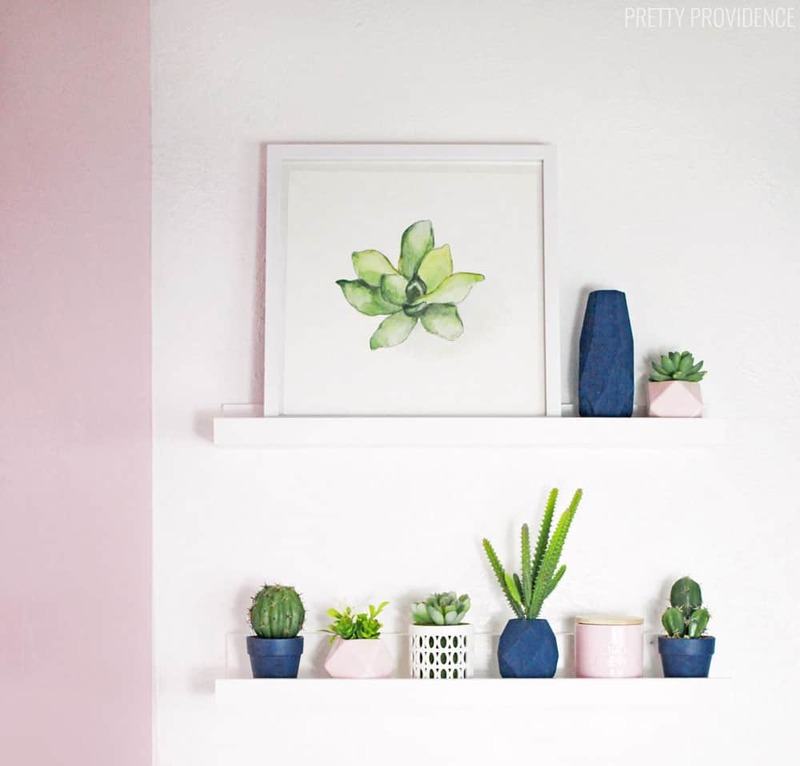 The pink and white vases I already had, the blue ones I actually painted with my accent color – Express Blue. I also feel like choosing either a shower curtain or a rug with personality is a good idea. 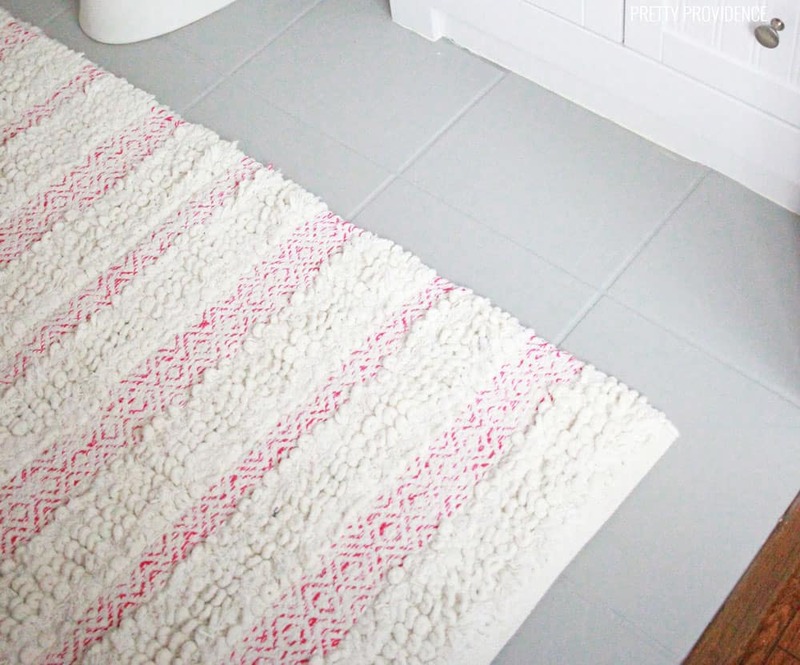 I prefer plain white shower curtains, but I found this cream and pink accent rug and it works so well in here! Okay, yes, I painted the tile! We want to re-tile this bathroom at some point, but for right now we needed a more quick and budget-friendly fix, so I painted it in this light gray called Sonic Silver. After I painted two coats, I did two coats of polyurethane. While it isn’t going to be this way long-term, I honestly think it looks so much better. If you are struggling to choose a paint color for your house, you need to check out the BEHR Color Clinic that will be happening next week from April 30th to May 4th! 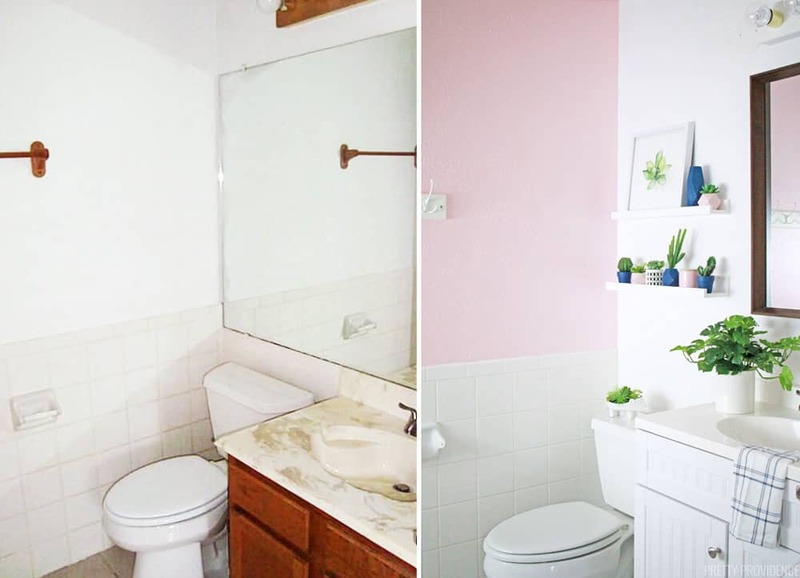 To give you some serious inspiration, 7 different designers and DIY bloggers have shared a color palette and before and after photos of our room makeovers on the BEHR website. We will also be answering questions about all things paint on Facebook, Instagram, and Twitter throughout the week. If you ask a question and use the hashtag #BEHRColorClinicSweepstakes you could be one of six people to win $500 to Home Depot and a professional design consult! How fun would that be!? I am seriously loving this color palette lately and my whole house is pretty much coordinated with these colors. I’ll be doing an accent wall soon with navy blue and I’m very excited about it. What is the next wall you’re going to paint?! looks fab! Did you re-glaze the tile? was there a strong odor? i’M THINKING OF DOING IT THIS SUMMER BUT HAVE YOUNG CHILDREN AND WASN’T SURE ABOUT THE SMELL. I didn’t glaze it I did two coats of polyurethane! I did it when my kids were gone for two days at their grandparents. The smell is strong and it’s fine once it’s dry but you probably wouldn’t want them in the house while you’re doing it. That looks fantastic, and like something even I could do.